A taskforce has been launched to increase the use of data published to IATI on thousands of aid, humanitarian and development activities. IATI’s new Data Use Task Force aims to ensure that the information shared by nearly 600 organisations globally is used to inform decision making and increase accountability. The Task Force met for the first time this month to review hours of contributions on data use from IATI members across governments, multilateral organisations, foundations, civil society and private sector organisations, following discussions at IATI’s Members’ Assembly (Rome, 3-5 October). Comments focused on which user groups to prioritise, the need to increase the quality of IATI data, improving tools and understanding governance arrangements. 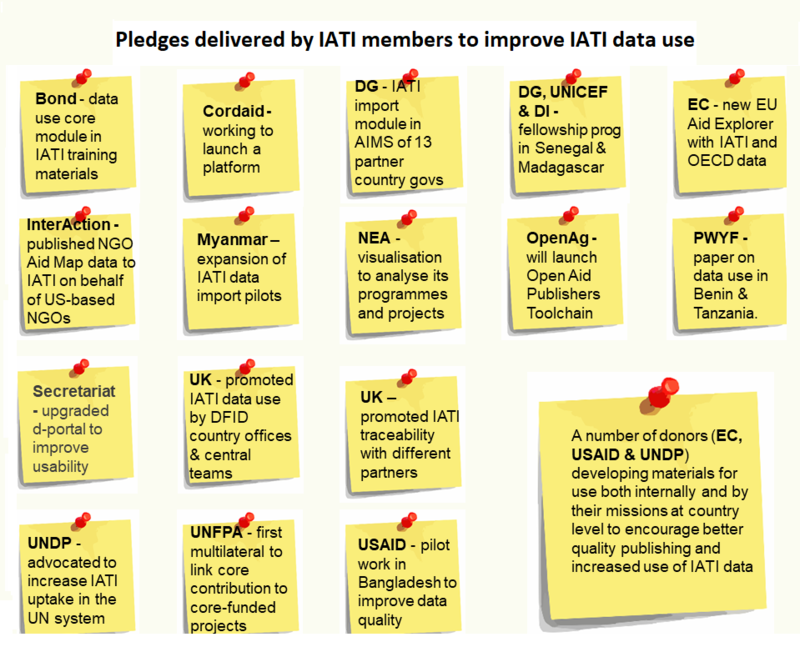 Over the last year, many IATI members have worked hard to deliver pledges they previously made (right) on improving data use. For example a project by UNICEF, Development Gateway and Development Initiatives embedded IATI fellows within the governments of Senegal and Madagascar to help their staff benefit from IATI. Now the Task Force is asking IATI members and its wider community to play a part in achieving systematic and routine use of IATI data to help achieve sustainable development. The Data Use Task Force is currently updating the data use strategy and workplan which will be submitted to IATI’s Governing Board for approval and shared online. For more information please email the Chair of the IATI Technical Advisory Group, John Adams.